I should make on thing clear as I begin this review: my expectations for this game were extremely high. Once I saw the first preview trailers, I knew that I had to purchase this game. The game seemed to combine old school RPG sensibilities with high production values, plus the massive characters and enormous bosses appealed to my inner Godzilla/Power Rangers nerd. While White Knight Chronicles is not the be-all, end-all, genre-defining game I had hoped it would be, it's still an excellent experience, and the co-op modes add some value beyond the single player story mode. The most impressive qualities of White Knight Chronicles aren't related to the gameplay, but the story. The plot itself is hardly groundbreaking, filled with several standard fantasy cliches, but there's an epic quality, a sense of grandeur throughout, that made me overlook these shortcomings. The game's lengthy cut scenes are of particularly high quality; they are so well done that my wife and kids would often sit down to watch the story unfold. Most RPGs have only a few boss characters, while everything else is the same size as your characters, but this isn't the case in White Knight Chronicles. In just the first few hours of play, you will encounter enormous trolls and a horrifying monstrosity of a beast that crashes through an entire castle. When the protagonist, Leonard, transforms into the White Knight, it's a jaw-dropping event. This first appearance of the White Knight is a memorable gaming moment, and the giant enemies he fights add to the feeling of grand adventure that the game ably provides. When the game begins, you are presented with a rather lengthy character creation process. I have never seen a more robust system, in any game. There are options, slider bars, and color choices for literally everything about your characters appearance. It took me about twenty minutes to finely tune my character's face, body style, and hair. But the character you create is merely a side character in the story, a sort of henchman for Leonard. This is a bit disappointing, but to be honest, I never wanted to play as my character anyway, because he didn't have the ability to turn into a thirty foot tall ancient artifact of unimaginable power. Your created character appears in the co-op portions of the game, though, which we'll get to later in the review. 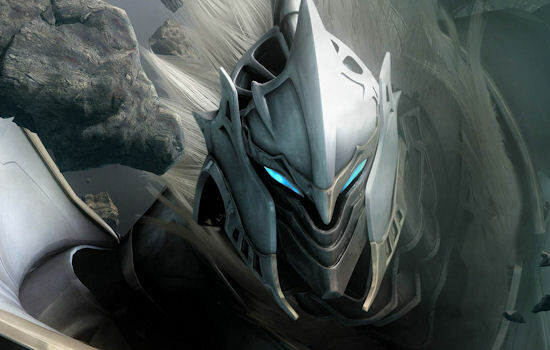 White Knight Chronicles uses a skill based character progression system. 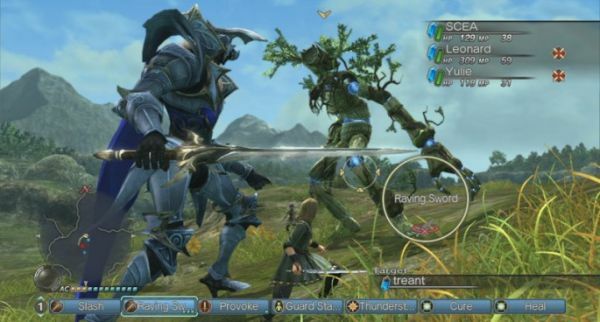 Characters can select skills with several types of weapons, plus elemental or divine magic. Skills fall into two basic types, those that can be used in combat, like fireballs or sword thrusts, and stat boosting skills, like weapon mastery, increased magic points, or heightened strength. I am generally not a fan of skill based systems, since they usually make characters too similar to one another. Perhaps it's just the retro gamer in me, but it feels strange seeing my entire party wielding swords, casting elemental magic, and also being able to heal and even resurrect others. Item use isn't restricted either, so if your caster-type character meets the requirements, she can waltz around in a set of chain mail or plate armor. Perhaps this homogeneity is lessened at higher levels, but I'd still prefer a bit more variety. Any skill that your character has can be used to fill a combat slot, and used in battle. A circular timing meter appears during a fight, and once that timer fills up, you may use a skill. Some skills are free, others take magic points, and still others take what the game calls action chips. Action chips are somewhat mystifying, and for the life of me I couldn't figure out how and when they were earned. Different in-game occurrences like hitting an opponent, taking damage, or casting a spell would sometimes, but not always, grant an action chip. Action chips can be spent to use combinations in battle, allowing you to perform multiple actions in the space of one timer cycle. Higher weapon skill levels allow for more actions per combo. For example, you might begin a combo with a strike, then an air juggle or two, and finish with an icebolt. There are literally hundreds of different combinations, which should be a min-maxer's dream, but since action points are so tough to come by, most of the time, you'll be using your basic, low level skills, which are free. I really got the feeling that I was in over my head as far as the combinations go, but in the end, I'm not sure if my lack of knowledge really hurt my characters' performance at all.